Apologies for the lack of contributions to the blog in recent times. I hope to remedy that with some long posts later in the year. 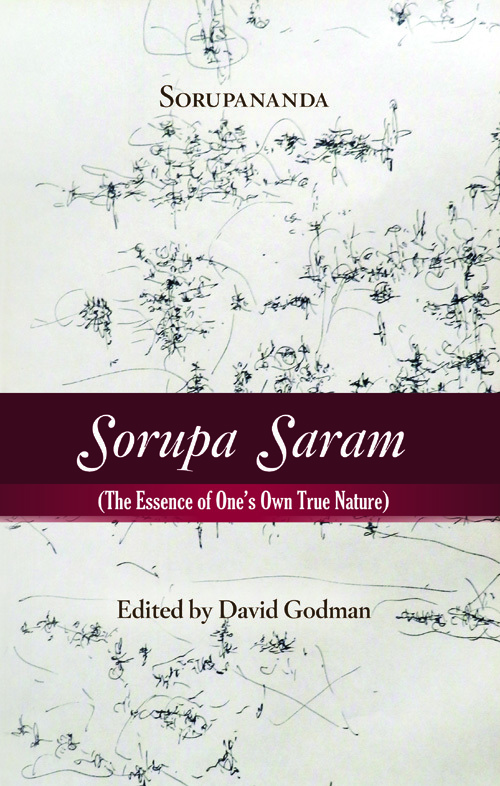 Meanwhile, I am happy to announce that I have recently brought out an edition of Sorupa Saram that contains the original Tamil verses, an English translation of them, and an introduction that summarises the available information about its author Sorupananda, his chief disciple, Tattuvaraya. The text has been revised by T. V. Venkatasubramanian and myself since it was published in 2011 on this blog. Congratulations for bringing out this gem. Hope you are doing well. Can't wait for more posts. :). 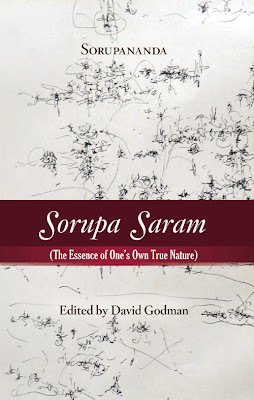 I have all along been searching for a English translation of Sorupa Saram of Tattuvaraya. Now this has come from your own pen, I am doubly pleased. I shall order for this book from Sri Ramanasramam. How come Sri Ramanasramam, has agreed to take this in their book stall? All cold wars are over? You have not mentioned the price of the book so that we can send DD to Asramam including courier charges. I showed an advance copy to the ashram president about ten days ago. He immediately went to the bookstore and said it should be sold there. I did not receive the next batch till yesterday. When I took fifty in this afternoon, the manager told me that the president had been in a few times recently, wanting to know why the book was not yet on sale. He is obviously delighted that the book will be on sale there. The price in the ashram bookstore is Rs 75. If you send me your postal address, I will be happy to mail you a free copy, along with 'The Dance of Siva', which I borrowed from you months ago and forgot to return. (Ph: (080) 93410 - 19205. "Sri Ramana thought so highly of this work, he included it on a list of six must-read books that he gave to Annamalai Swami in the 1930s." Could somebody kindly point me to where I can find this list of 6 books? 'Sorupa' is the Tamil rendering of 'Swarupa'. This is great. There was an english version online I found a while ago.. I remember downloading it in the Westminster Reference Library. It really is one of the greatest Advaita texts. Thought blossoms explode with every reading, like a spear piercing the veil which clouds the eye. How fortunate that there is a proper hardcopy available, I shall order one at once! Apologies for posting something not related to this thread at all. Is there a blog or a thread on who are the Jnanis currently living in India? My objective is obviously to try and meet them and learn from them. Of course, most of us cant recognize a Jnani and hence I would appreciate if advanced seekers could answer this question. David Godmanji knows well I need not tell this in his blog. But out of childish curiosity , I am telling before he replies. Mathru Sri Sarada and Sri Lakshmana Swamy are living jnanis living in Thiruvannamalai. But you cannot have their darshan . They are not interested in meeting people. Please go and get details of whatever you look for. I end this with a powerful brief hint: please be humble, have complete faith and don't insist on darshan. Their mode of transferring Grace is on the mind level. Not that they need to meet you to know about you. Long time since you posted an "article" as such. When can we expect one? I am looking for a self realised teacher. Can anyone recommend or suggest someone I can meet and be in his or her company. Only a self realized teacher can recognize a self realized teacher. Therefore, only a self realized teacher can tell you "Here is a self realized teacher". But a self realized teacher will nerver tell you "Go to see this self realized teacher". Moreovoer, a self realized teacher has nothing to teach, thus he is not a teacher. He is called "teacher" only by those who are not self realized. You heard or read about self realization, so you are looking for a self realized teacher, and you think self realization has to be taught. Why do you want wise company ? If you search who is the one who wants to be in wise company, you will find the one you are looking for. The meeting will take place in due time, you don't have to decided when or where you will meet THE Guru. If you meet a guru, it is not THE Guru, because THE Guru is not a Guru. Do you understand ? If you think "Yes, I do", you are wrong again. But be careful, because this message is from a foolish man. An option to buy this book and the other ones in some electronic format(like kindle) would be nice!! Thank you. It is with the help and guidance of much evolved selves like you that novices like me (?) even begin to glimpse the possibility of self-realization. I have just come back from 3 weeks at the Ashram. It has been a wonderful experience. The presence of Bhagvan is overwhelming.